As you can probably tell, we here at Bearhug love us a good t-shirt, and we love us a good tv series to binge on too. But you know what you really love? A good quality tee inside a good quality show. 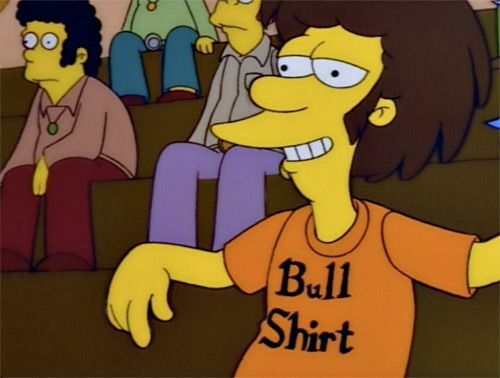 But what are the best t-shirts ever featured in the world of television? Well, we’re here to answer that for you. Here (in no particular order) are the Top 10 T-Shirts from TV Shows. Li’l Sebastian – he was an animal, a legend, a friend. But while he was alive, and if you were lucky enough to meet this Indiana legend, you got to own this beautiful shirt. 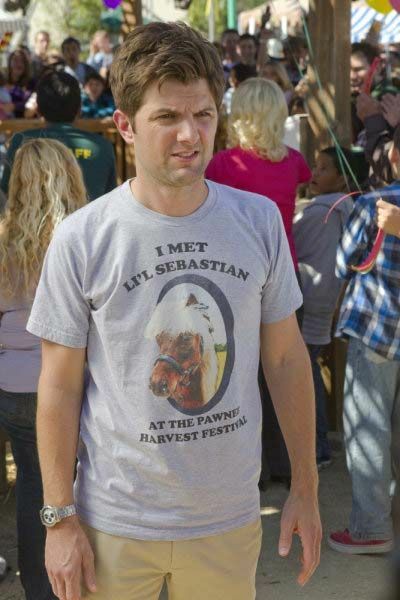 Ben Wyatt may not agree, but we love the retro font and slight fade on the tee’s graphic; it couples well with the whole feel of Pawnee, out-dated yet charming. He may have been li’l, but his impact on us all was anything but. Even though it looks like a hair metal band logo straight out of the 80s, it turns out that Magna is actually a now defunct obscure cigarette brand. But I don’t think Charlie Kelly knows that, or even cares. Regardless, we still think it looks awesome. Just like everyone else that watched the amazing Stranger Things, we here at Bearhug instantly fell in love with Dustin, so much so that Luke couldn’t help but draw his favourite character straight away. Just like everything about the hit show, Dustin’s style is quintessentially 80s, and we absolutely love it. An artichoke festival may not sound all too exciting, but at least Dustin got a lovely shirt out of it. A Dustin t-shirt? Well, I guess there are ‘stranger things’ out there you can buy. Back in the late 90s, wrestling tees were all over the place. While we’ve got to crack open a cold one in respect to the classic Austin 3:16 shirt from WWF/E Monday Night Raw, the awesome NWO shirt, worn by the likes of Hulk Hogan, Scott Hall, and Kevin Nash, has to earn a place on this list. It was even worn recently by Kendall Jenner at a Michael Kors fashion show, proving that the simple, worn-out design is just too sweet, and we’re sure it will stay that way 4 life. It may be simple, but you’ve got to love that retro baseball jersey style text coupled with the subtle crossed bats logo on the sleeve. The girls both feature on our M.A.T.E.S tee. Luke’s fresh looking Will Smith artwork. Even in the midst of a zombie apocalypse, young Carl Grimes still had chance to look cool with this strange yet awesome Science Dog ringer t shirt. Wow, this t-shirt is dy-no-mite. With that lovely retro font and 70s colour scheme, teenage Lenny clearly had style, and that’s no bull. It may not be spelt out as blatantly as Lenny’s is, but here at Bearhug we have our very own Bull Shirt. (Also available as a hoodie). When he wasn’t saving America as FBI agent Burt Macklin, or shining shoes, or falling down pits, or diagnosing people with “network connectivity problems”, Andy Dwyer was in a band, and when they finally managed to settle on a name, they made a pretty sweet looking band tee. Here at Bearhug HQ, we love bears (obviously). We love deer. We love beer. So when Mac from It’s Always Sunny wore a t-shirt with a bear with deer antlers on called a Beer, of course we were going to love it! Mac has plenty of fantastic pun shirts, but obviously this has to be our favourite. So, what are your favourite TV show t-shirts of all time? Let us know by leaving a comment below or drop us a tweet @thebearhugco.